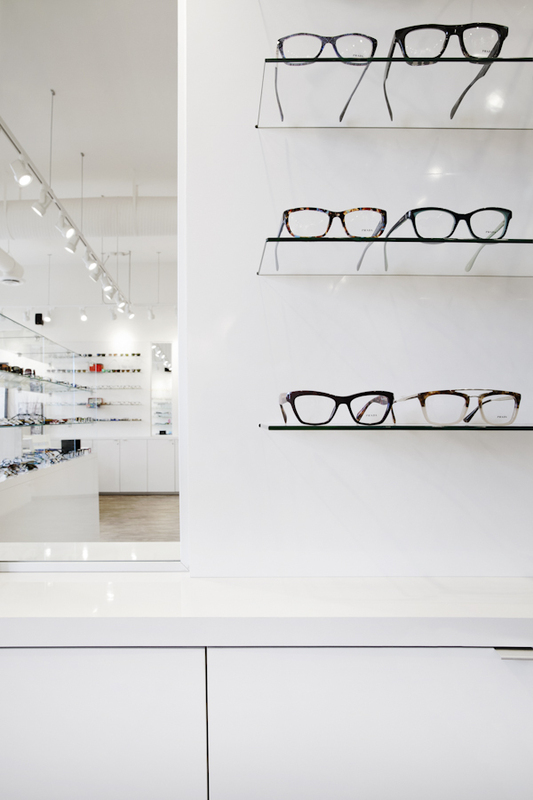 Collaboration between architects and interior designers is integral to producing a successful project, and in this post we will share how the synergy between architect and interior designer, however simple, influenced and shaped a minimalist retail project. Synergistic relationships in business are often a consequence or a response to a need – as opposed to a core process. Design synergy, as a core value, is best illustrated as a strategic partnership in service or in fabrication– where two entities decide to share resources and knowledge to work together in order to achieve what neither could have done independently. 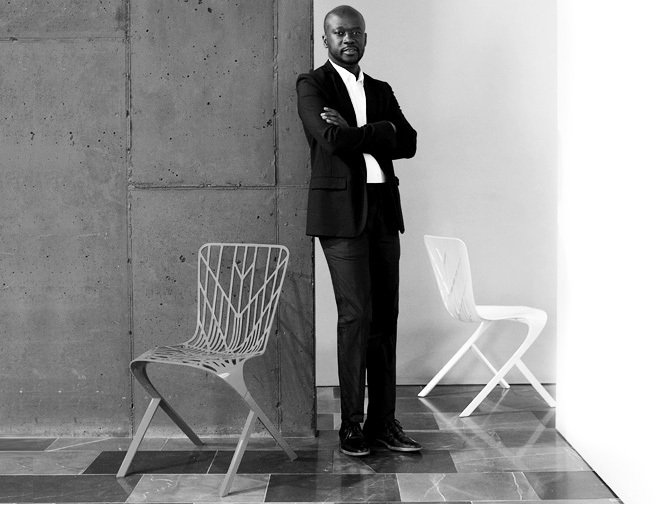 In the design world, the success of synergies between designer and fabricator or between disciplines can be seen with Hansgrohe & Stark, Vola & The Danish Arts, or Knoll & Adjaye as examples; each representing core values in alignment through synergy. When it comes to the integration of professional services in architecture and interior design, synergy between these disciplines are typically still the exception and not the rule. The proliferation of specialization within professional service industries as a whole is partly to blame. The fallout for many is ultimately, as the saying goes, the inability to see the forest through the trees. 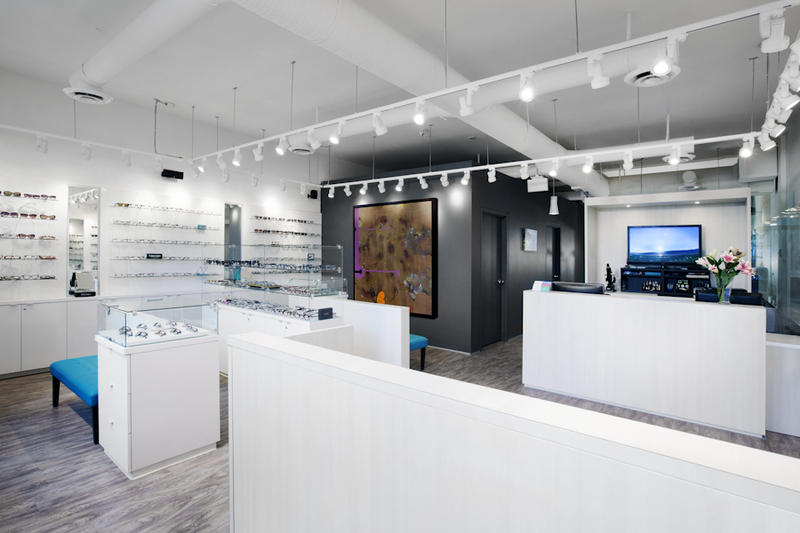 Last fall, we were asked to help design a modern and engaging optometry clinic in an uninspiring, existing retail space. 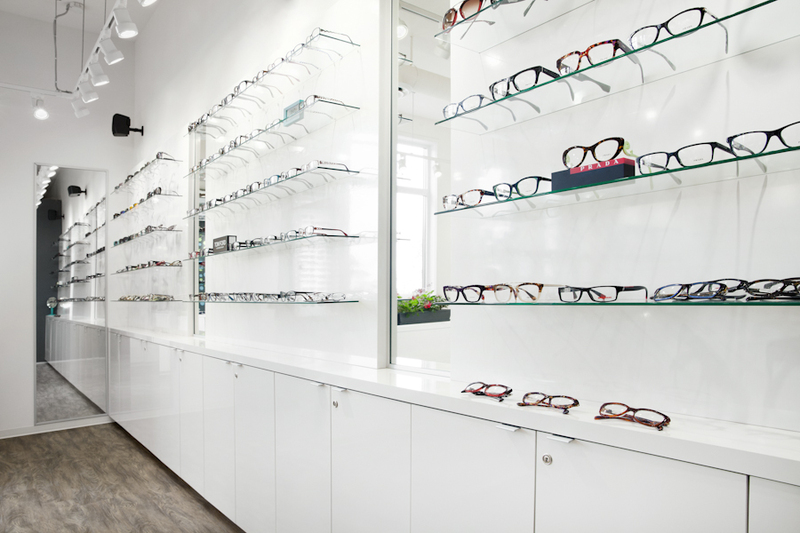 The program for this clinic was clear: to accommodate both retail for eyewear frames and private office/exam room within the same space. While the main retail space needed to be more accessible, social, and interactive, the examination portion of the space needed to be more private, diagnostic, and metric. The opposite, yet indispensable, requirements implied an interesting juxtaposition; the optometry practice needed its own synergetic cooperation of spaces. In this project, the architectural perspective (the “parti” of the project) influence the interior design and the sensual aspect of the play between something controlled and measured results in the selection of a fashionable wearable creation. As such, within the whole of the space (an imagined white display box – like a clothing retail store), dark grey cubes, with formal metric qualities where the environment can be controlled, serve as private examination rooms. 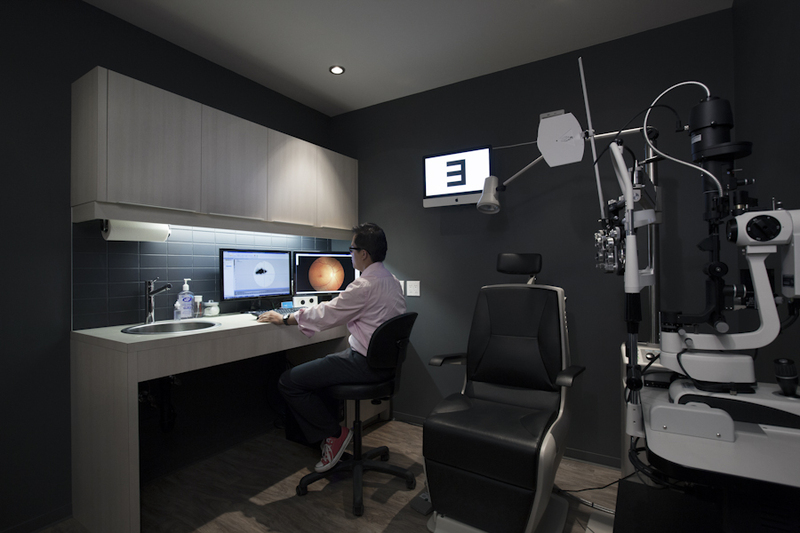 Other smaller metric constructions are iteratively placed through the space to “support” the specialization of the service offered by the optometrist. In the end however, all of these small specific volumetric constructions are in service of the greater space; they help divide, organize, and speak to both the “clinical” and “fashionable” role of the Optometry Clinic. The end result is a space containing a collection of floating forms in a variety of scales. 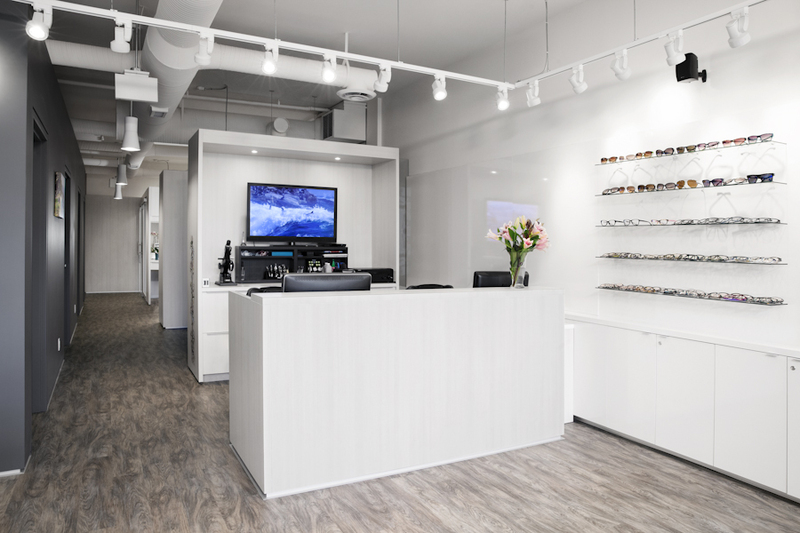 The space now functions seamlessly with each element performing its clinical or retail duty while providing the end user with a fashionable space for their eyewear needs. The influence of the architecture is only, in-as-much, to provide a sustainable business setting that addresses the juxtaposition of the examination to the interactive retail mandate. 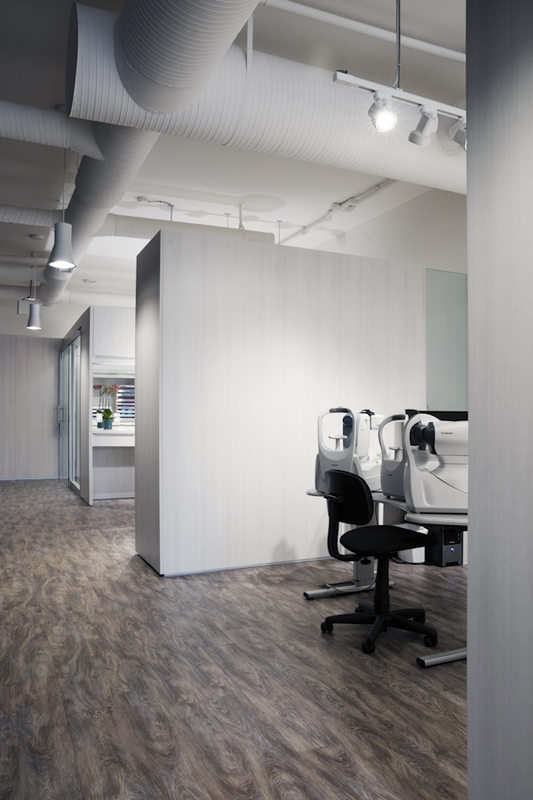 The interior design evolves each piece, its function, color, and material providing both a backdrop to the eyewear collection and an integrated clinical work environment for the client. The interior design works as a large display, a constant for the collection of frames; a milieu for consumer choices. 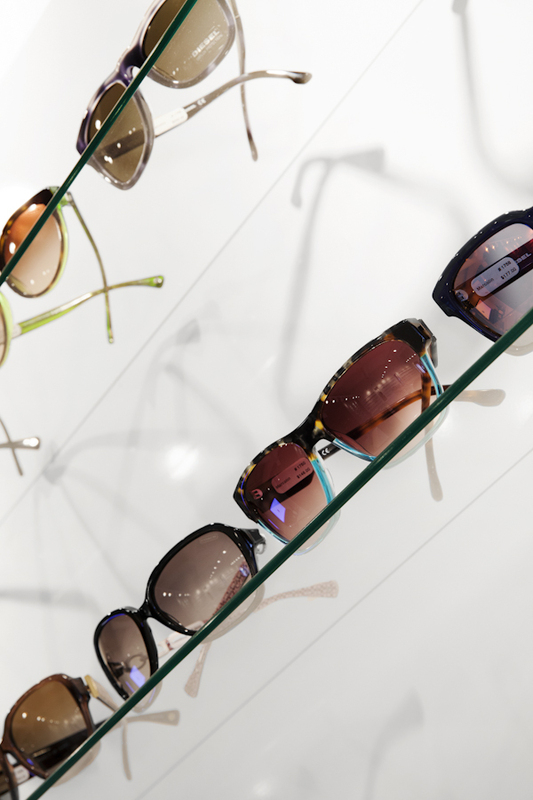 The eyewear collection will change, the examination equipment will evolve, the owner might even decide one day to introduce some splashes of color – but in the end, the architectural synergy between serviced and served spaces and its expression will remain constant. What is the “Parti” that ties the whole space together? Does the “Parti” meet the functional aspects of the space? What is the overall volumetric and aesthetic experience of the space? 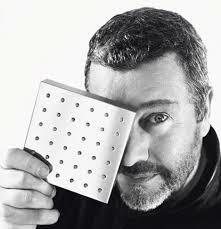 Is the designed solution going to stand the test of time so our client’s investment is long term? “Collaboration” and ‘synergy” is distinct from mere cooperation. Too often in the design industry, a project goes through its sequential departments; the architect sets the building, passes the project to the technologists who draft the plans, who then sends the drawings to the interior design department to pick the finishes. An architect and an interior designer may be involved in a project – the architect typically focused on the exterior and the interior designer on developing the interiors – but they are often done exclusively, with neither discipline interacting with the other. 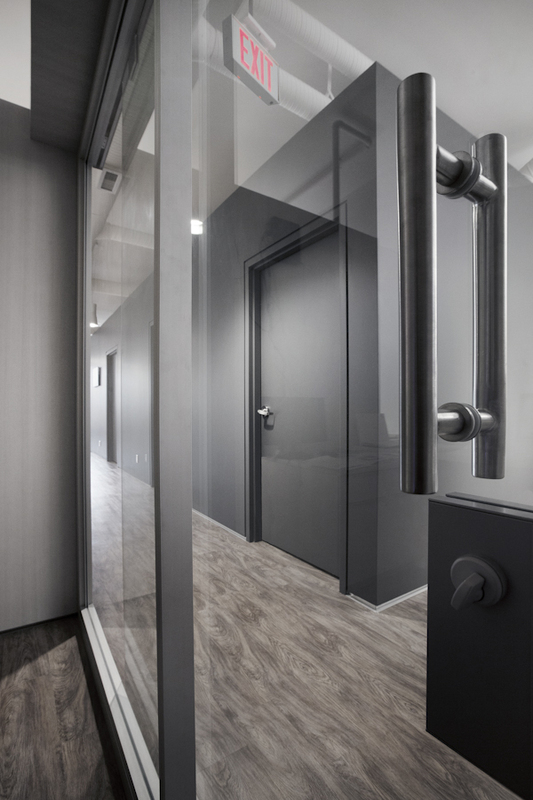 In other scenarios, the architect may develop the entire project themselves, including both the building envelope and the interiors, completely exclusive of the interior designer. Both approaches are a lost opportunity, with the dynamic potential that exists for the interiors and exterior to relate to one another in meaningful ways greatly diminished. It should go without saying, then, that the greatest client successes – the ones which demonstrate the most creative and inspiring design solutions – should be those in which synergy is involved, where all aspects the design is “vetted” through its entire inception. You can cooperate with someone and always go through the same mechanical process, but when you collaborate with someone you are both asked to evolve your design thinking, and as a result both perspectives are changed and influenced.